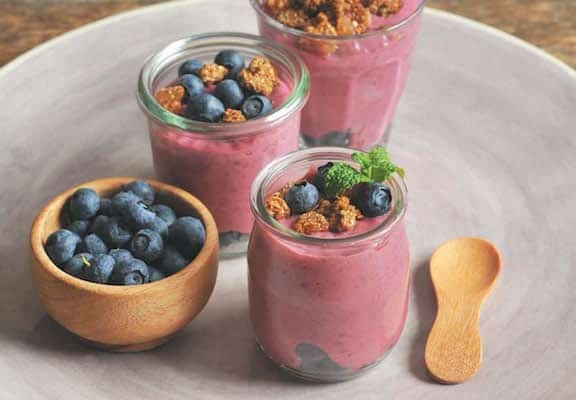 We love serving this pudding-like, fruity treat in pretty glasses or jars for a light breakfast or snack. If you want to fancy things up a bit, a dollop of coconut whipped cream is also great. Recipe and photos from The Great Vegan Protein Book by Celine Steen and Tamasin Noyes. @2015, Fair Winds Press. Reprinted by permission. 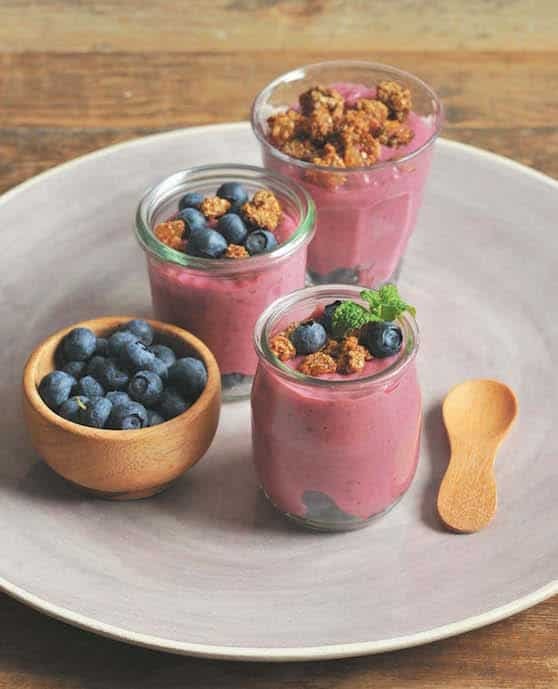 We love serving this pudding-like, fruity treat in pretty glasses or jars for a light breakfast or snack. Place the thawed raspberries in a blender or use an immersion blender to blend the berries until smooth. If you don’t like berry seeds, pass the mixture through a fine-mesh sieve. Add the tofu or yogurt, maple syrup, and sugar to the berries and blend again until smooth. Place into a large bowl. Stir the chia seeds and vanilla into the mixture. Cover and chill for at least 3 hours or overnight. Stir before serving. Divide the chia preparation on top and sprinkle with the remaining berries. Leftovers can be stored in an airtight container in the refrigerator for up to 4 days. The results will be far richer, but you could use cashew cream instead of tofu or yogurt to make this soy-free. Be sure to prepare it to the consistency of yogurt by adding extra water, if needed. it must also be super smooth. Adjust the quantity of extra sugar as needed. You could also simply use more maple syrup instead of (any) granulated sugar. Regular chia seeds are okay to use, but white chia seeds make for a prettier result.